The time after Epiphany and before Lent is called Ordinary Time. This year, Ordinary Time runs from February 3 to February 28. Lent begins on Ash Wednesday, which falls on March 1, 2017. During the Epiphany season, the Sundays are reckoned forward from Epiphany on January 6, so we talk about the 'first Sunday after Epiphany', the 'second Sunday after Epiphany', and so forth. After Candlemas on February 2 - the last day of the Epiphany season - the Sundays are reckoned backward from Lent. So today is called the 'fourth Sunday before Lent'. It may also be called the 'fifth Sunday after Epiphany'. The theme of Ordinary Time is the rhythm of life anchored by the weekly Sunday gathering in the church. to break every yoke and silence evil tongues. Amen. "Sunday is the day of resurrection, the day of the new creation, the day of the beginning again. On the seventh day God rested from his work of creation. But on the first day God acted to re-create the world. Thus Sunday, the eighth day, brings creation and re-creation together in a very special event - Sunday worship. Thus the Sundays of ordinary time are not so ordinary - they celebrate the full story of God's action in history to save creatures and creation. This is the special nature of ordinary time. It is the day to celebrate the re-creation of the world." Click on each event to learn more. In the bottom right corner, click the plus sign (+) to add the E-Church Calendar and integrate it with your phone's calendar app. We hope the E-Church Calendar is another tool for you, your family, and your church to stay immersed in the Gospel story throughout the year! February 2 is the Feast of the Presentation of Christ. Some churches call it "Candlemas". It's the culmination of the Epiphany season, and brings to a close the "cycle of light" that began with Advent. From here, we begin the "cycle of life" as we journey through ordinary time, then Lent, Holy Week, Easter, and Pentecost, and then ordinary time again until next Advent. Malachi 3:1-4: "Behold, I send my messenger, and he will prepare the way before me. And the Lord whom you seek will suddenly come to his temple...". Psalm 84: "How lovely is your dwelling place, O Lord of hosts! My soul longs, yes, faints for the courts of the Lord." Hebrews 2:14-18: "Therefore he had to be made like his brothers in every respect, so that he might become a merciful and faithful high priest in the service of God, to make propitiation for the sins of the people." saving people everywhere from sin and death. complete your purpose once made known in him. that all the world may glory in the splendor of your peace. Amen. Candlemas articulates the necessary future of this beautiful Light coming into the world. Our celebrations so far [in Christmas and Epiphany] have dwelt on the joyful implications of the Son of God’s arrival, our redemption, salvation, and deliverance. Candlemas reiterates in a pointed way that the coming of the Lord includes difficult things – the persecutions of Jesus in His ministry and the call of the Christ to suffer the Cross. Candlemas rounds out our thoughts regarding the significance of the Word become flesh, and moves us forward to Lent. - Fr. Wayne McNamara (Christ the King Anglican Church), "The Meaning of Candlemas"
From Malcom Guite, "A Sonnet for Candlemas". It ends thus: "We glimpse with them, amidst our busyness, / The peace that Simeon and Anna knew. / For Candlemas still keeps His kindled light, / Against the dark our Saviour’s face is bright". Presentation in the Temple (14th century), Musée de Cluny, Paris. This Sunday is the fourth Sunday after Epiphany. It's the last Sunday in "Epiphanytide," which culminates on February 2 (the Presentation of Our Lord). Here are resources to prepare you for the coming week. This week's lectionary readings remind us that Christ's ministry and the church's mission are not about strength and power, but about justice and mercy, meekness and humility, about turning the world upside down. The way of Christ is often counterintuitive. Micah 6:1-8: "He has told you, O man, what is good; and what does the Lord require of you but to do justice, and to love kindness, and to walk humbly with your God?" Psalm 15: "O Lord, who shall sojourn in your tent? Who shall dwell on your holy hill? He who walks blamelessly and does what is right." 1 Cor. 1:18-31: "For the word of the cross is folly to those who are perishing, but to us who are being saved it is the power of God. . . . For the foolishness of God is wiser than men, and the weakness of God is stronger than men. Matt. 5:1-12: "Blessed are the meek, for they will inherit the earth." and you call us to walk humbly with you. your rule may come as blessing. Amen. There is a besetting paranoia that plagues the superpower mentality and it is most often manifest in an anxious obsession with security. Anxiety over security is the price the aggressive pay for clawing their way to the top—they are fated to live in constant dread that someone will take away their position of privilege. They worry about who might be hot on their heels. But Jesus, endorsing the psalmist, says there is another way, a way that is blessed and peaceful—the way of radical trust. The meek are not the driven, self-assertive, hyper-aggressive, grab-my-piece-of-the-pie people—they are not the winners and go-getters, the movers and shakers, the large and in charge. The meek are the ones who believe in God and are willing to trust God for their portion and their security. The way of violence and aggression is the way of Caesar. The way of meekness and trust is the way of Christ. And they are in contradiction to one another. - Brian Zahnd, "Blessed Are the Meek"
Joseph Chaumet, detail of Via Vita, 1894-1904. Next Sunday is the third Sunday after Epiphany. The season of "Epiphanytide" runs from January 6 to February 2, and the focus is on the proclamation of Christ as Messiah and the mission of His Church in the world. The emphasis on mission invites us also to think about unity within the body of Christ. Today, January 18, marks the beginning of the Week of Prayer for Christian Unity, an ecumenical celebration that recalls Jesus’s prayer for unity in John 17: "that they may become perfectly one, so that the world may know that you sent me and loved them even as you loved me." Here are resources to prepare you for the coming week. The lectionary themes for the week are Christ's calling of the disciples and the unity of the Church. Isaiah 9:1-4: "[I]n the latter time he has made glorious the way of the sea, the land beyond the Jordan, Galilee of the nations. The people who walked in darkness have seen a great light; those who dwelt in a land of deep darkness, on them has light shone." Psalm 27:1, 4-9: "One thing have I asked of the Lord, that will I seek after: that I may dwell in the house of the Lord all the days of my life, to gaze upon the beauty of the Lord and to inquire in his temple." 1 Corinthians 1:10-18: "I appeal to you, brothers, by the name of our Lord Jesus Christ, that all of you agree, and that there be no divisions among you, but that you be united in the same mind and the same judgment. Matthew 4:12-23: "While walking by the Sea of Galilee, he saw two brothers, Simon (who is called Peter) and Andrew his brother, casting a net into the sea, for they were fishermen. And he said to them, 'Follow me, and I will make you fishers of men.'" Anglican priest and poet Malcom Guite reads his sonnet "The Call of the Disciples," from his book Sounding the Seasons: Seventy Sonnets for Christian Year. The song selection for this week is "Dear Lord and Father of Mankind" (lyrics), a congregational hymn especially popular in the UK. Italian artist Duccio di Buoninsegna composed this piece, Christ Calling the Apostles Peter and Andrew, in 1319. The church season often called "Epiphanytide" runs from January 6 to the Feast of the Presentation on February 2. In this time, Christians focus on the revelation of Christ to the world and His universal mission: to Israel and to all nations. Christ came for all people — rich and poor, Jew and Gentile, slave and free, male and female — because, as the Apostle Paul tells us, we “are all one in Christ Jesus” (Gal. 3:28). This week, too, many Christian churches will observe the Week of Prayer for Christian Unity beginning on January 18, an ecumenical celebration that recalls Jesus’s prayer for unity in John 17: "that they may become perfectly one, so that the world may know that you sent me and loved them even as you loved me." Whether by chance or providence, Americans celebrate the memory of Dr. Martin Luther King, Jr. on the third Monday in January, a date which invariably falls during Epiphanytide. It is a perfect occasion for reflecting on what unity within the church means. Dr. King's 1963 "Letter from a Birmingham Jail" is one of his most famous works. It was a response to an open letter by eight Alabama clergymen entitled "A Call for Unity," which branded Dr. King an "outsider," urged "a realistic approach to racial problems," and, in response to peaceful civil rights demonstrations across the South, called for "law and order and common sense." But be assured that my tears have been tears of love. There can be no deep disappointment where there is not deep love. Yes, I love the church. How could I do otherwise? I am in the rather unique position of being the son, the grandson and the great grandson of preachers. Yes, I see the church as the body of Christ. But, oh! How we have blemished and scarred that body through social neglect and through fear of being nonconformists. There was a time when the church was very powerful – in the time when the early Christians rejoiced at being deemed worthy to suffer for what they believed. In those days the church was not merely a thermometer that recorded the ideas and principles of popular opinion; it was a thermostat that transformed the mores of society. Whenever the early Christians entered a town, the people in power became disturbed and immediately sought to convict the Christians for being "disturbers of the peace" and "outside agitators." But the Christians pressed on, in the conviction that they were "a colony of heaven," called to obey God rather than man. Small in number, they were big in commitment. They were too God-intoxicated to be "astronomically intimidated." By their effort and example they brought an end to such ancient evils as infanticide and gladiatorial contests. Things are different now. So often the contemporary church is a weak, ineffectual voice with an uncertain sound. So often it is an archdefender of the status quo. Far from being disturbed by the presence of the church, the power structure of the average community is consoled by the church's silent – and often even vocal – sanction of things as they are. Dr. King pleaded for a true Christian unity – unity defined by a commitment to justice – praising those Christians who were "active partners in the struggle for freedom." "I hope the church as a whole will meet the challenge of this decisive hour," he wrote. He concluded his letter in that same spirit, expressing his hope to meet each of the clergymen who wrote him "not as an integrationist or a civil-rights leader but as a fellow clergyman and a Christian brother." "Let us all hope," Dr. King wrote in the letter's final paragraph, "that the dark clouds of racial prejudice will soon pass away and the deep fog of misunderstanding will be lifted from our fear drenched communities, and in some not too distant tomorrow the radiant stars of love and brotherhood will shine over our great nation with all their scintillating beauty." View an original early draft of the "Letter from a Birmingham Jail" and listen to audio of Dr. King reading the letter here. Sunday, January 15, 2017, will mark the second Sunday after Epiphany. We are still within the Epiphany season. Isaiah 49:1-7: " I will give you as a light to the nations, that my salvation may reach to the end of the earth." Psalm 40:1-11: "I have told the glad news of deliverance in the great congregation; behold, I have not restrained my lips, as you know, O Lord." 1 Cor. 1:1-9: "[S]o that you are not lacking in any gift, as you wait for the revealing of our Lord Jesus Christ, who will sustain you to the end, guiltless in the day of our Lord Jesus Christ." John 1:29-42: " “Behold, the Lamb of God, who takes away the sin of the world!" Almighty God, whose Son our Savior Jesus Christ is the light of the world: Grant that your people, illumined by your Word and Sacraments, may shine with the radiance of Christ's glory, that he may be known, worshiped, and obeyed to the ends of the earth; through Jesus Christ our Lord, who with you and the Holy Spirit lives and reigns, one God, now and for ever. Amen. Epiphany brings us to the end of the Christmas cycle, completing the great rhythm of expectation and fulfillment that defines this period of time. It also points to the beginning of Christ's manifestation to the world, a ministry that not only happened in the first century but happens now within the church and within us as we travel through the unfolding of the paschal mystery of the liturgical year. – Christopher Wordsworth, "Songs of Thankfulness and Praise"
The Feast of the Epiphany on January 6 marks the end of Christmas and the beginning of the season of Epiphany. The word "epiphany" means "manifestation." The season begins by celebrating the Magi's visit to the baby Jesus – an event that marks the revealing of Christ to the Gentiles. Epiphany also draws our attention to the other ways that Christ revealed Himself as Messiah: his baptism by John when a voice from heaven declares Him to be the Son of God, and His first miracle, turning water into wine at the wedding in Cana. The central theme of Epiphany is proclamation, and it's appropriate in this season, as we reflect on these events in Christ's life, to focus on the mission of the Church. The liturgical color is white. 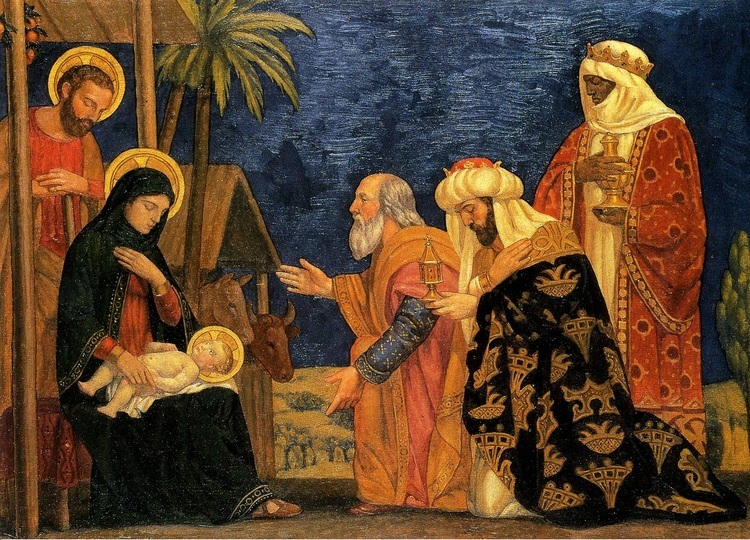 Epiphany ends on February 2, the Feast of the Presentation (sometimes called Candlemas), which recalls the day that Jesus's parents presented him in the Temple, according to the Law of Moses, where Anna and Simeon prophesied over him. After February 2, we enter Ordinary Time until Ash Wednesday, the beginning of Lent, which in 2017 falls on March 1. Our goal at KeepingAdvent.com is to reacquaint Christians not only with the seasons of Advent and Christmas, but with the Church Calendar more generally. That's because all time is sacred. The annual seasonal cycle of the Church Calendar keeps us immersed in the Gospel story, helping us to walk with Christ throughout the year. A redesigned and simplified home page, with a section called "What Time Is It?" that highlights the current church season, dates, themes, and how to learn more. Throughout the year, the blog will feature posts on the different church seasons and special days, with resources aplenty: lectionary readings, prayers, short reflections, and selections of music, poetry, and art. We want to know if this site is useful to you, and whether and how we can improve it. Don't hesitate to contact us with feedback. Today, December 27, marks the feastday of John, the beloved disciple. St. John did not die a martyr. According to tradition, he lived a long life and cared for Mary, the mother of Jesus, in her latter years. St. John's feastday follows that of St. Stephen, and falls on the third day of Christmas. St. John gave us a simple yet profound teaching: “Beloved, let us love one another” (1 John 4:7). It’s customary on this day to drink a cup of mulled cider or wine called wassail (the word literally means “be healthy”), and to thank God for the blessings of life and health. Shed upon your Church, O Lord, the brightness of your light, that we, being illumined by the teaching of your apostle and evangelist John, may so walk in the light of your truth, that at length we may attain to the fullness of eternal life; through Jesus Christ our Lord, who lives and reigns with you and the Holy Spirit, one God, for ever and ever. Amen. Enjoy a cup of "St. John's Wine" and drink a toast to family and friends. The easiest way to make St. John's Wine, or wassail, is to buy a bottle of red wine (merlot works well) and a packet of mulling spices. For each quart of wine, add 2 tablespoons of spices to a cheesecloth. Place the cheesecloth in the wine and simmer in a saucepan for about 20 minutes. Serve the wine hot, and garnish with a cinnamon stick and orange slice. It's a wonderfully warm drink for a cold winter's night.